The Saniclave 200 is the least expensive of its kind. 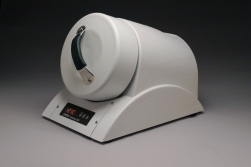 With a digital timer, printer connection, and dry mode the compact and versatile Saniclave 200 can sterilize wrapped or unwrapped solid, mated, hinged or knurled instruments without fail. A front loading, corrosion resistant, stainless steel chamber, and door make this steam sterilizer extremely easy to load and clean. The Saniclave 200 delivers exceptional performance at the lowest possible price. This unit is FDA approved. FDA 510 pre market approval number: K112811. Foot print dimensions: 21" x 13.5"
Maximum load configuration: 3.5 lb. This model is FDA approved. FDA 510 pre market approval number: K112811.